Tacu Tacu, who serve streetfood from Latin America, is back at Grow in Hackney Wick for a short residency from 7th - 24th April, Thursday to Sunday. Famous for dishes like the octopus burger, they will also be serving other tasty treats like the Mojito Cheesecake, and banana bread French toast. Go! 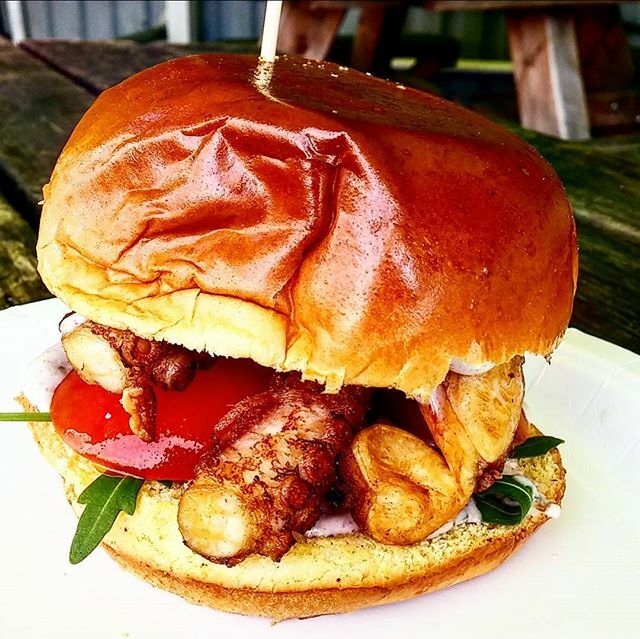 "Latin America streetfood outfit Tacu Tacu return to take up the reigns of the kitchen at Hackney Wick's Grow bar between 7th April and 1st of May. Expect an eclectic colourful menu which will include rotating specials - highlights include Chocolate Beef Tacos, Banana Bread French Toast with Margarita Cream,THAT infamous Mojito Cheesecake, the instagram favourite Peruvian Octopus Burger and much more of the likes that London has never seen before. For the big eaters among you- look out for the Pambazo- brought London for the first time- a sandwich formed from bread dipped in a Guaijillo chile sauce before being fried then filled with lettuce, spiced black beans, chorizo and sour cream- EPIC! It is really an unmissable residency for any self-confessed London foodie. Make sure you come with empty stomachs and fully charged phones because it is going to be foodporn galore. Follow them on facebook (facebook.com/tacutacufood) for advanced details of the "special of the day" as well as the events schedule. Alongside the food delicious food offering Grow will be running a diverse series of music and art performances. Grow is tucked away in a yard in Hackney Wick, backing out onto the canal and carved out of what was once a sausage factory, Grow has been transformed into a totally unique bar, kitchen and creative space. Built and run by a small team and operating as an experiment in ethical and sustainable business, it's a space for music, art, conversation and good food where everyone is welcome."